Women in rural Ethiopia have to trek through the desert for an average of two and a half hours every day to access drinking water. A new Facebook Messenger experience aims to convey their struggle with a bot called Yeshi. Charity: water, AKQA and Lokai, maker of the popular silicone bracelets, have come together to create "Walk With Yeshi," an interactive experience designed specifically for Facebook’s Messenger. 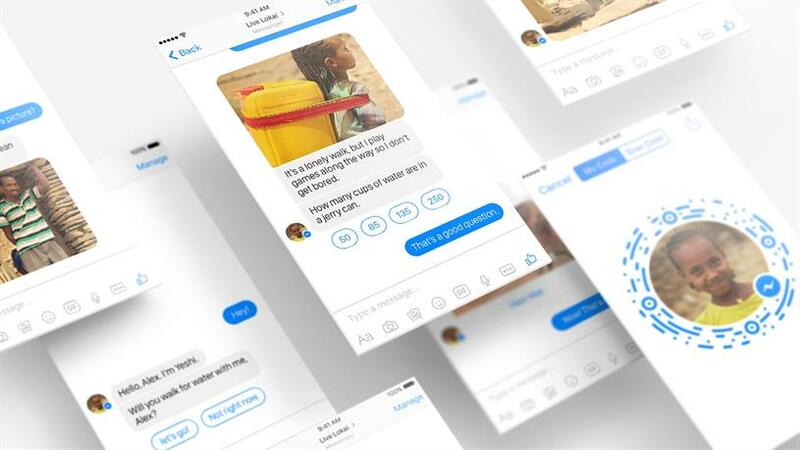 By texting with the bot, users can virtually accompany Yeshi, a fictional Ethiopian girl (the name means "the one for a thousand") on her long journey to retrieve water. Yeshi interacts with the user by sending texts, images, videos, sound files, maps and GIFs of her surroundings during her trip. "While you spend your day at school, work or with friends, my day is on this path," she says, and "The first thing you notice is the heat." Steven Izen, CEO of Lokia, said the idea for Yeshi arose from the brand’s desire to use modern tools to help people understand the water crisis. Six hundred sixty three million people don’t have access to clean drinking water, according the charity:water. To cut through the "clutter of social media," the brand went straight for a messaging platform. Izen knew that an intimate and personal experience would work best when raising awareness of the crisis. "As humans it’s easy to tune out crises as a problem in some far off place," he said, "As we all know, when we are affected personally or know someone who is affected, then the crisis or problem becomes real for us." "We realized we would have to create a bot and experience that felt intimate and real to users," said Izen. "Our answer was a modern version of taking a walk together and having a chat." Although Yeshi doesn’t always reply to every message and the conversation is notably one-sided, the bot does ask about where the user lives, if the user wants to meet her family and if the user could send pictures of his or her home. The experience is broken down into 10-20 minute sections. "This allows for the experience to feel a bit more like how an actual conversation would flow on a long walk," said Izen. To begin the interaction, users message "hello" to Live Lokai similar to how a user would private message a friend. To stop the experience at any time, users can type "Stop walking." Overall, the experience lasts two and a half hours, depending on how often the user interacts. The time frame is meant to mirror the amount of time it takes an actual Ethiopian woman to reach a source of water. "We knew going into this that two and a half hours would be a big ask for some people," said Izen. "What’s great is even struggling with making time for the full experience is a way to gain perspective. Time is precious to everyone, including those who walk to access water daily."